Host Zealot Review 2019: Is Host Zealot a Good Hosting? HostZealot may look like an average low-cost provider, but their features are anything but ordinary. 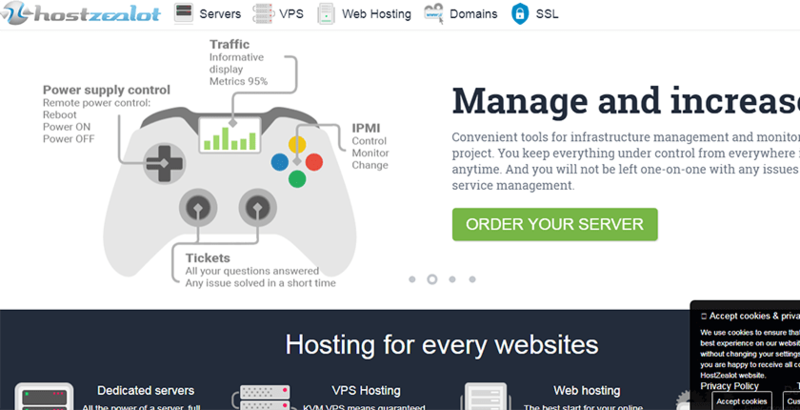 If you're looking for greater control over your web hosting, check them out. HostZealot is a U.K. based hosting company that’s offered web hosting services since 2009. They are not your standard low-cost web hosting provider. In addition to the standard features you see from most hosting providers, their advanced features are perfect for experienced webmasters looking for more control over their website. HostZealot has web hosting centers in the U.S., Canada, and the Netherlands and offers an impressive array of standard and value added-features to all plans. HostZealot doesn’t offer a ‘point and click’ website builder, so they aren’t appropriate for those looking for Wix-style hosting. They do provide installation apps for WordPress, Joomla and other platforms, so those familiar with setting up those sites on those platforms can use HostZealot. Otherwise, this platform is perfect for any web designer familiar with using cPanel and FTP to build websites. They also offer the ability to code in web programming and scripting languages, such as PHP5, Perl 5, and others. The disk space on these plans is very limited. If you max out your domains on Scout or above, you may run into storage issues. Observer and Scout don’t offer the ability to pay monthly, but the plans are so inexpensive that it’s a non-issue. The bandwidth on these plans should be more than adequate for any site needs. If you can find a way to max out the bandwidth on these plans, then I want you to be my webmaster. HostZealot’s customer support needs improvement. Presently, they do not offer telephone support. They only provide support through an online ticketing system and via Skype. There are no other live chat alternatives. Also, the site does not have a knowledge base available. They do have a blog with a few helpful tutorials, but the blog is only updated a couple of times a year. Overall, this is one of the worst support systems I’ve seen in a while. HostZealot offers a set of standard and advanced features that give you the ability to create the perfect website. While support may be lacking compared to other services, they make up for it by giving you greater control for the ways you can design your website. Wondering how Host Zealot stacks up against other Web Hosting companies? Enter any other Web Hosting company and we will give you a side-by-side comparison.